You may have heard of many methods to remove the gamy flavor from venison. Well, we tested 12 of them to see what worked… and what didn’t. Gamy venison (or gamey, depending on your preferred spelling). Nobody likes it. There are some people who claim they do – but I say that they probably haven’t had a truly gamy piece of meat. Yes, venison tastes different than beef or pork. But different doesn’t mean “gamy”, and most deer you eat, if properly handled all the way from the shot through to the freezer – won’t have a gamy flavor. But if you eat enough venison, or are unfortunate to have some poorly handled/poorly processed venison – at some point you will encounter some truly gamy meat. What causes it? 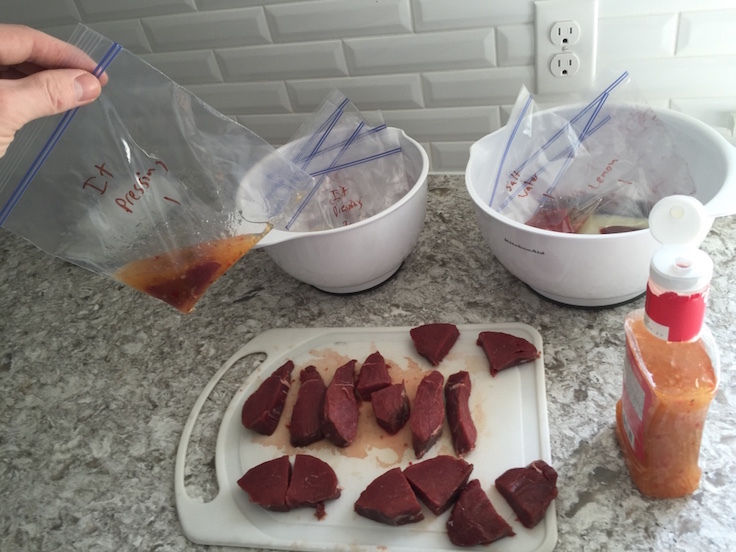 The two biggest causes of that venison “funk” are simple: spoilage and hormones. Spoilage happens a number of ways: bad shot, poor field dressing, and improper aging being the major contenders. All of these, you as the hunter, have a degree of control over. The hormonal gaminess you can control as well. If you see that buck of a lifetime, with the big rack, and the neck that’s as thick as a California Red Wood – if you decide to shoot him – expect some funk. That little 3×3 or that doe will taste MUCH better. Now, I’m not here to chastise your hunting or processing techniques. Let’s just say you have a deer in the freezer that’s got some gaminess. As I said: it’s going to happen at some point. Let’s focus on what you can do with it. As it so happens, I have a 5 point in the freezer right now that I would classify as a mildly gamy deer. He is perfectly in the “acceptable” flavor range to me: not the greatest, but not a deal breaker either. The wife on the other hand – yeah, his flavor is a deal breaker. In prepping for our test, we tried to maintain consistency across all variables – from the thickness of the cuts, to the cooking and resting times. So, I decided to test out some techniques that I’ve heard (and some I’ve used) that people have claimed to remove that gamy flavor. I took a “scientific” approach to keep things fair. I cut all samples of meat to be tested from the buck’s loin, into equal thicknesses and sizes. I placed all chuncks of meat in separate plastic bags, each with it’s own “game removing solution”. I did two samples for each method I tested – one sample was aged for one day, the other for two days. At the end of each waiting period, each piece of meat was rinsed in water, and patted dry with a paper towel. I then cooked each piece of meat in an oven at 400° for 7 minutes. Next I removed from the oven, covered with foil, and let rest for 5 minutes. All our test subjects after marinading for two days. You want to remove gaminess? Turns out the secret is probably sitting right in your fridge. Following is the breakdown on each method. It turns out that soaking for an additional day did not further reduce the gaminess in any of the samples, so I won’t go into detail on the day 2 results. Just keep in mind: these were thin slices – if you have a large roast you want to treat, you should consider soaking it longer, slicing it, or poking holes in it so the fluid can reach more surface area. I was sadly disappointed. I had not previously tried this method, but it just SOUNDS like it would be good. Butter. Milk. Come on! But no. It had next to no impact on the gaminess, but it did impart an acidy taste to the steak that wasn’t all that pleasant. It DID have a mild tenderizing affect, though I likely wouldn’t use it again. The champion of the test. 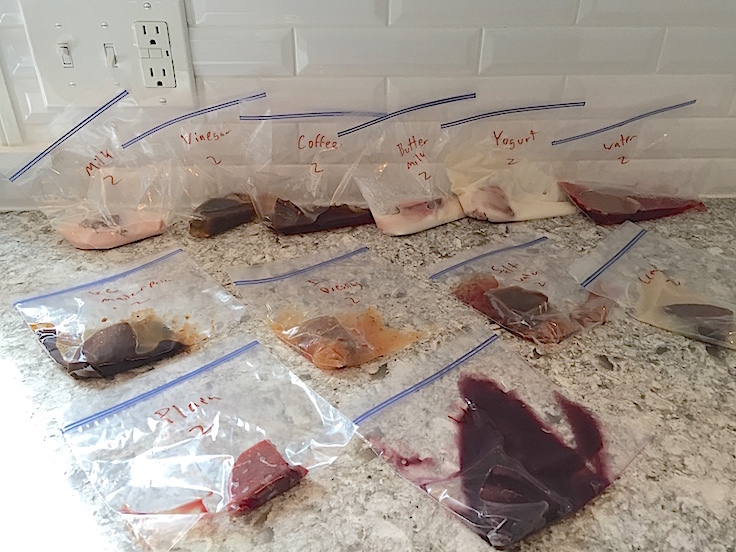 I’ve heard from many people who use milk to marinade their wild game: from venison to fish. And it truly works – the best of all 12 ways we tried. We used whole milk – I may need to do further testing to compare the various fat contents of milk, but the result was great. There was no gaminess left in the cooked steak, and it did not alter the taste of the steak. The only downside was the result was slightly less tender than other methods. If you use milk, you will want to additionally use a chemical or physical method of tenderizing the meat before you cook it. We used vanilla yogurt – which may not have been the best choice. It was fairly effective at removing the gamy flavor, but it did impart a vanilla flavor to the meat that was not that enjoyable. Vanilla flavor is good for ice cream. Not steak. It did have a better tenderizing effect than plain milk though. In future tests I’ll try a plain yogurt. I like pickled heart. The result here was about the same. But I won’t ever pickle a steak again. Though it WAS effective at removing gaminess. The vinegar changed the structure of the meat. It became jello-like when raw, but still cooked firmly. The acid in the vinegar actually “cooked” the meat – if you look at the cross section of it above, you’ll see there is no red in the cooked center. Never again. We used a red wine. It was very effective at removing the gaminess, though it imparted an acidy, overpowering wine taste to the meat. 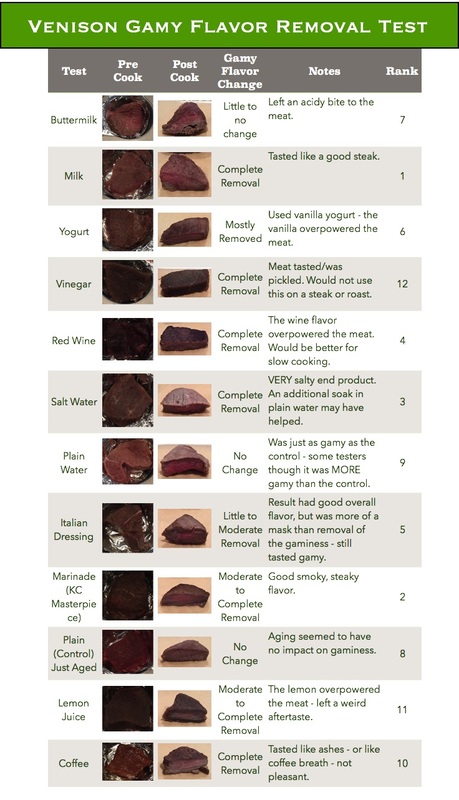 I use red wine all the time in slow cooking venison – I will probably stick to using it for those recipes. It also made the steak tough – so it’s probably not worth it to try again even for a shorter soak time. Salt water was very effective at removing gaminess, and also made a very tender steak. On the downside, the result was VERY salty. If we soaked it again for another night in plain water, it may have helped – but then you have a two step process to go through. 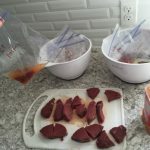 I constantly hear hunters say that they will continually soak their whole deer in ice water for several days after quartering it or butchering it (changing the water several times). I have personally never done this. And after this test, I never would. The theory is that it gets the blood out, and therefore the gamy flavor. What we found in our test (and we all agreed), was that the sample soaked in plain water tasted MORE gamy than the sample that we didn’t do anything to. On top of that, it was TOUGHER. Now, this was one test, so I’m not claiming it’s the be all, end all on the subject – but it’s a practice I have no plans for trying out again. This was a middle of the roader. The dressing didn’t do a lot to change the gaminess, but it added a masking flavor to the meat that was pleasant. Though the gaminess still was apparent.It also had little to no impact on tenderness. We used KC Masterpiece’s Original Steakhouse marinade – which we like for general steak cooking of any kind. It was good at removing the gaminess, and it had a nice tender result that had a nice BBQ/smoky flavor. This one was a tough call, but we’d say it was just slightly less effective than the milk method at removing the gaminess. One other note – the marinade seemed to have a similar “cooking” process to the vinegar and lemon juice. The day 1 result wasn’t noticeable, but the “rare” line in the day 2 sample was noticeably thin and uniform, and not from the oven cooking. Our unadulterated sample – nothing applied but time. Which interestingly is a method some people claim will impact the gaminess: aging. This is another activity that I don’t do. Sometimes I butcher my deer the same day I kill it, and it hits the freezer usually within 24 hours of that. At most, it’s done in 1 to 2 days – and that’s based on circumstance – when do I have time, was it an evening hunt, etc. 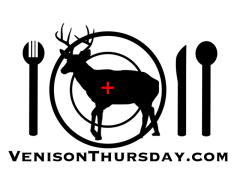 A number of respected resources on the matter will say you typically shouldn’t age your deer for more than 4 days. Now, with this test, we didn’t go that long. But I did test 3 cooked versions of this one: the day we started the test, after day 1, and then the day 2 round. We did not notice any impact on gaminess by aging the samples. There seemed to be a tenderness advantage to aging – but that was subjectively debated. For our test, the aged samples were only really effective at being comparative objects we could sample the other methods against. No advantage otherwise. Coffee was surprisingly effective at removing gaminess. Though it added an overpowering, unpleasant coffee taste. I like coffee. But this was more like “coffee breath” flavor. Yeah, not good. This might be interesting in a slow cooker recipe, but it was not good on the steak. It was also the TOUGHEST sample we tried. 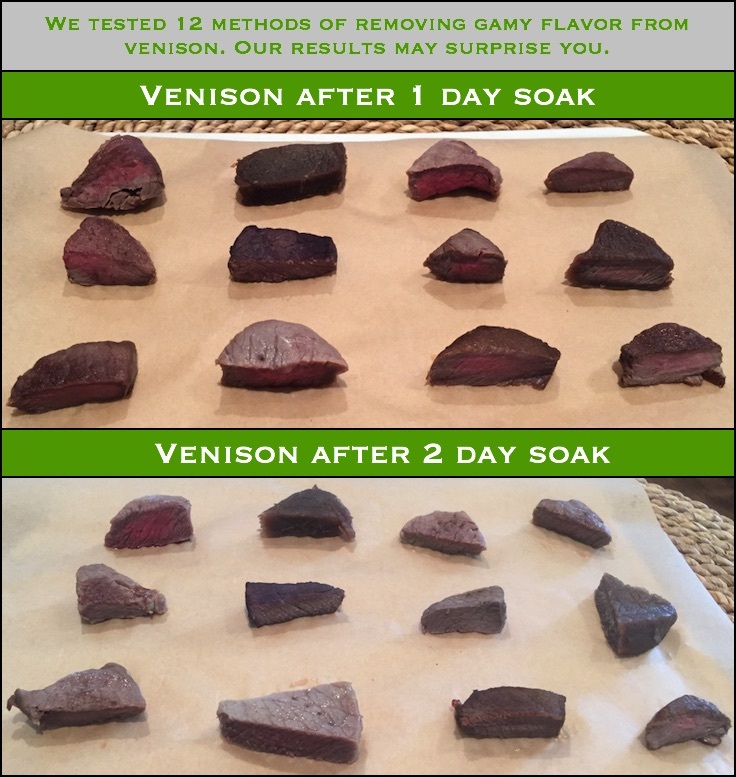 I would be remiss if I didn’t bring up corning venison as a method to remove gamey flavor. It is more effective than ANY of the tests we did here, but I excluded it from the test because of the time needed for the process, and it’s really best for tough roasts.